My blog was featured over at Be@Home, and I mentioned that I try to post behind the scenes process kind of work. Coincidentally, also this week was the release of the book Creating Comics, which features a lot of comics creators talking about their working process. So, to continue the trend, today's post is about my process on a recent illustration project - drawing a seven page story for Sorted! as part of their comics series. 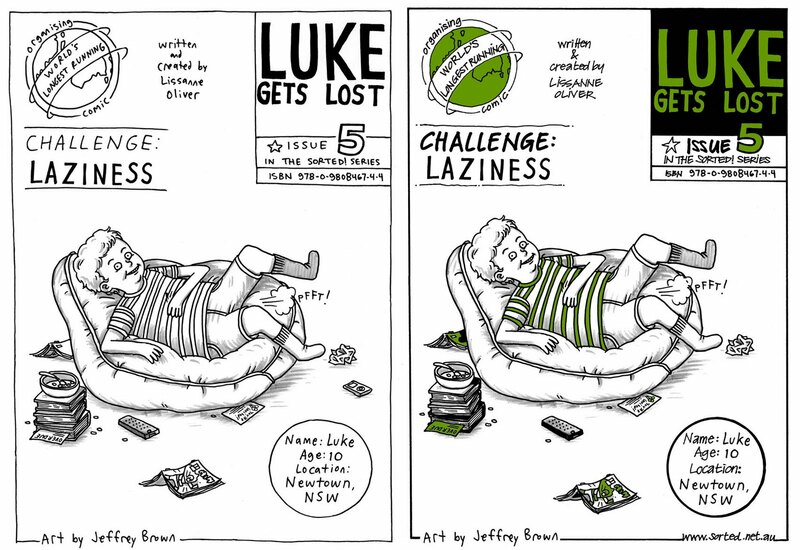 My story is Luke Gets Lost, about a ten year old boy who's a bit lazy. • Luke sitting in a beanbag or over stuffed lounge chair. He’s grinning. He’s a big sloth. Step one was to pencil out the rough idea for the composition. After sending that to Lissanne, we talked about making the beanbag chair more beanbag like, so I re-worked that before inking and adding the gray tones. Then I needed to fit my drawing into the cover template, along with adding some green. This required a bit of photoshopping, which I'm still not very good at. 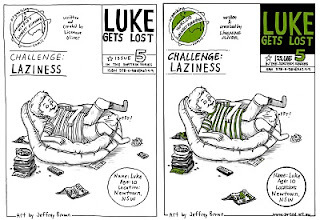 After all this, there were a few problems - Luke was a little big and dominating, with not as much white space, and seemed to be crowded into the cover. Lissanne suggested shrinking the size, reversing the image, and tilting the chair back a bit. Some of the details needed adjusting, such as the stack of books which became lost visually next to the beanbag, or that I spelled 'you're' as 'your' on the invitation. She also mentioned wanting the story to be drawn more loosely and sketchy - along the lines of how I drew AEIOU or Every Girl Is The End Of The World For Me. I wanted the cover to match the interior, so rather than manipulate the image in photoshop - which would take me a while - I figured it'd be just as well for me to spend that time simply re-drawing the cover. So I reversed and shrunk the image in photoshop and printed it out, and then used it as an underlay, since the paper I was drawing on was thin enough to see through. I hand tilted the drawing and used that as the pencils, fixing some of the details and letting the drawing become rougher and less finished. Of course, I find I'm unable to draw quite the same way I did when I was drawing AEIOU. I put more pressure on myself to make things just right nowadays, so maybe I end up reworking - and overworking - things. After a few false starts (mostly just drawing Luke's head and having it feel just a little off), I ended up with the inked cover complete with grays. Then I fit the new drawing back into the cover template, along with making some minor adjustments like getting rid of the ipod. After the cover there were six more pages to draw, and rather than inking the pencils I'd finished for them all, I printed those out and used them as underlays. When those were finished there were more corrections to be made. Sometimes I'd made mistakes in the text, and in some places Lissanne wrote new text. There were some panels with minor adjustments and a few I redrew entirely. This was the first story I've drawn written by someone else, save for a short two page zine piece, and although it felt stressful to work on at times, when it was finished it didn't seem like it had been so bad. I think sometimes the idea of how hard something will be can be just as bad as if it were hard in reality. I feel like all in all it was a good experience and turned out well. I love this blog, awesome job!